You’re invited back to the Big Band Era for a one-night only event featuring Richard Morrison and the JT Big Band. 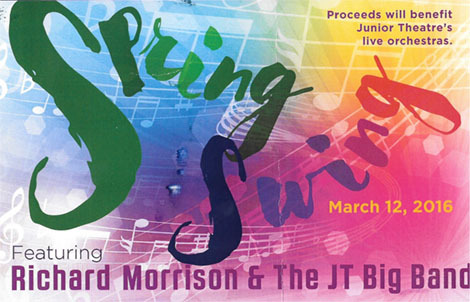 Spring Swing features special guest performances from San Diego Junior Theatre Alumni Eileen Bowman, Daryl Daley, Connor Marsh, Emma Wineman, and more. Swing dancing and attire are encouraged, but not mandatory! Food, drink, and silent auction. Proceeds will benefit San Diego Junior Theatre’s live orchestras. $15 for Students 14 and under, $35 for Adults. $50.00 per person, includes preferred seating, 2 drink tickets, and $20 worth of raffle tickets. For group rates and reservations call the box office. A swing dance workshop will be offered from 5:45-6:30 by SDJT dance teacher Leasa Thernes.